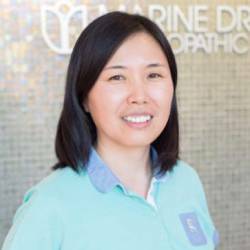 Youna Kim is a Registered Acupuncturist in British Columbia and a member of CTCMA (College of Traditional Chinese Medicine Practitioners and Acupuncturists of British Columbia). She has studied and practiced acupuncture and moxibustion in both Asia and Canada. She uses Korean and Chinese style acupuncture and Japanese style moxibustion. Her treatment consists of twelve meridians diagnosis and whole body health analysis. Her acupuncture needling methods are gentle and painless, using the smallest gauge needles. She believes that optimal health happens when one is living in harmony with nature, and thus the treatment of illness must also be found in natural ways for a beneficial result. Youna carefully considers the root of illness, and delivers the treatment for her patients with this in mind. Acupuncture is a gentle and safe treatment method that promotes the circulation of bio-electric current (Qi) and blood in the area of the aliment. With acupuncture, the body regains its healing power effectively and recovers health status naturally. Both the World Health Organization (WHO) and the National Institute of Health (NIH) acknowledge the benefits of acupuncture as an effective treatment for various health issues.